Since 2009, Milnor's PulseFlow® Technology has been winning over satisfied customers who are impressed with the unprecedented water and utility savings. An estimated 500 million gallons of fresh water will be saved in 2013 alone thanks to the over 150 PBWs operating worldwide. Milnor's PulseFlow Technology (patent-applied for) was verified by a third-party and awarded a Certificate of Innovation over four years ago. Despite all of PulseFlow's successes, Tim King, a true laundry veteran, was never a fan of tunnels. King's 43-year career included posts at four commercial (healthcare, uniform, and hospitality) laundries, none of which employed tunnel washers. He said, “I never wanted a tunnel because they weren't able to get whites white. There is no agitation.” In 2003, at the age of 50, Tim King retired from the laundry industry without ever experiencing the benefits of running a tunnel laundry. That is, until Tim King received a call from his friend Rich McKevitt of Steiner-Atlantic Corporation two weeks after he retired from the industry! Rich called to tell Tim about the ImageFIRST facility in Clearwater, FL, founded by Tim Ryan and Sharon Pulnik, a small healthcare laundry that was looking to expand their healthcare laundry in his area. Tim King was out of retirement and back in the laundry business as ImageFIRST Clearwater's Partner and General Manager. 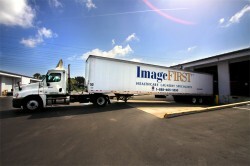 ImageFIRST, Clearwater began operations in one unit of a ten-unit office park in December 1999. Since then, the laundry has been processing linen from area out-patient, ambulatory, diagnostic, endoscopy, imaging centers, hospices, and surgery centers. They own the various healthcare linen, including 18 different styles of hospital gowns. The laundry also processes doctor coats, employee scrubs, bed linen, operating towels, and bath towels. Their 2,000 ft2 laundry has now grown to encompass all ten units in their office park at a total of 40,000 ft2. The weekly sales have gone from zero to nearly $160,000.00. As business grew, so did the demand on the aging equipment—two 450 lb. open-pocket washers. Tim King understood that the production would benefit from a tunnel washer, but was unsure of the quality. Once again, Rich McKevitt reached out to Tim to introduce him to the growing PulseFlow. They flew to New Orleans to tour the Milnor factory with Regional Sales Manager Sam Kielman and President Jim Pellerin, followed by a visit to one of the first PulseFlow laundries, which processes healthcare linen. ImageFIRST worked with Pellerin Milnor, Steiner-Atlantic, and Speed Check to layout the new tunnel system, which included one 8-mod 76039 150 lb. capacity PBW™ tunnel washer, one MP1656 110-150 lb. capacity 56-bar single stage press, and six 64058 TG1 200-300 lb. capacity pass-through dryers. When it was time for the installation, Tim King relied on Rich McKevitt again. Even though this was the first major install for McKevitt, King knew that he could see the project through seamlessly. McKevitt was responsible for every person involved in the installation—from plumbers and contractors, to every manufacturer rep (Milnor, Chicago, and Speed Check). Along with large open-pocket washer-extractors, the laundry features two 42026 V6J 140 lb. capacity washer-extractors, one 30022 V6J 60 lb. capacity washer-extractor, one M175 170 lb. capacity dryer, and one M410 410 lb. capacity open-pocket dryer. This equipment mix processes hospital scrubs (with snaps), mats, and rewash items, which accounts for approximately 17% of the daily production—4,850 lbs. per day. 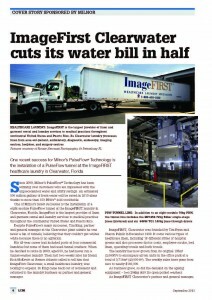 ImageFIRST Clearwater runs as much linen as possible through the tunnel because of its inherent savings. Since starting up the tunnel in December 2012, the laundry's water bill has cut in half! This water savings is quite impressive considering the laundry still employs the two open pocket washer-extractors. Their PulseFlow tunnel is consistently consuming a mere 0.4 gal/lb. and has allowed the laundry to go from a 17.5 hour day to a 7 hour day—reducing an entire shift! The laundry also uses Milnor's Mildata® software to monitor, record, and analyze production data. As you can imagine, Tim King and the partners (President/Owner Tim Ryan, CEO/Partner J.C. Ryan, and Sales Manager/Partner Sharon Pulnik) are elated with their decision to purchase a Milnor PulseFlow tunnel. King is also excited to introduce PulseFlow Technology to other ImageFIRST franchisees next month during their biannual profit enhancement meeting. In fact, they requested the next meeting be held in Clearwater, so the group may better understand the revolutionary tunnel washing concept and potentially implement in their own laundries. Tim King and his ImageFIRST Clearwater partners hope to grow their business even more, so they may purchase another PBW™ tunnel. They already know where it will go—in the building across the street (they've already leased all 10 units in their complex)! For more information about PulseFlow Technology, visit www.milnor.com/pulseflow_technology, email milnorinfo@milnor.com or call 504-712-7656.